The research is still in its infancy (pun intended), but researchers are hopeful that this low-cost, accessible, and positive practice could have transformational effects. Here are four benefits for pregnant women. Mothers-to-be don't spend their entire 40 weeks of pregnancy glowing radiantly; there are also midnight worries, endless shopping lists, and swollen feet. Somewhere around 18 percent of women are depressed during pregnancy, and 21 percent have serious anxiety. Research is starting to suggest that mindfulness could help. Not only does cultivating moment-to-moment awareness of thoughts and surroundings seem to help pregnant women keep their stress down and their spirits up--benefits that are well-documented among other groups of people--it may also lead to healthier newborns with fewer developmental problems down the line. Jen, an entrepreneur friend of mine who recently had her first child, was put on bed rest and couldn't even exercise to keep her stress down. "I had so much anxiety," she recalls. "Meditation really helped me stay calm and sane." She isn't alone. 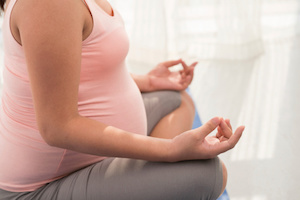 In a small pilot study in 2008, 31 women in the second half of their pregnancy participated in an eight-week mindfulness program called Mindful Motherhood, which included breathing meditation, body scan meditation, and hatha yoga. In two hours of class per week, participants also learned how to cultivate attention and awareness, particularly in relation to aspects of their pregnancy: the feeling of their belly, the aches and pains, and their anxiety about labor. Compared with women waiting to enter the program, participants saw reductions in their reports of anxiety and negative feelings like distress, hostility, and shame. These were all women who had sought therapy or counseling for mood issues in the past, but the program seemed to be helping them avoid similar difficulties during a chaotic and transformative time of their lives. A 2012 study of another eight-week mindfulness program found similar reductions in depression, stress, and anxiety compared with a control group, though only 19 pregnant women participated. In interviews, participants talked about learning to stop struggling and accept things as they are; they remembered to stop and breathe, and then take conscious action rather than acting out of anger or frustration. "I've learned to take a step back and just breathe and think about what I'm going to say before I open my mouth," one participant said. These stress-busting and mood-lifting effects mirror those found in mindfulness programs for the general public, but can mindfulness help with the specific anxieties and fears that go along with pregnancy? Many pregnant women have a loop of worries that easily gets triggered: Will my baby be healthy? I'm scared of labor. Something doesn't feel right--do I need to go to the doctor? A 2014 study looked specifically at these feelings, called pregnancy anxiety. Forty-seven pregnant women in their first or second trimesters, who had particularly high stress or pregnancy anxiety, took a mindfulness class at UCLA's Mindful Awareness Research Center. For six weeks, they learned how to work with pain, negative emotions, and difficult social situations. Compared with a control group who read a pregnancy book, participants who took the class saw bigger decreases in their reports of pregnancy anxiety during the duration of the experiment. Mindfulness, perhaps, gave them the tools to navigate complex emotions that wouldn't budge, even in the face of the most reassuring reading material. "It is inspiring to witness a mother with extreme fear of childbirth cancel an elective caesarian because she now feels confident enough in her own strength to go through the birthing process," said one mindfulness teacher. "It is humbling to hear how the couple whose first baby died during labour were able to stay present during the birth of their second, observing their fear without getting lost in it." Not all mindfulness involves meditation; you can also become more mindful by noticing the way moods and bodily sensations fluctuate throughout the day. This type of mindfulness can counter our tendency to be "mindless," when we assume things will be the way we expect them to be--the way they were in the past--and we don't notice new experiences. For example, pregnant women might expect pregnancy to be exhausting and painful, so they pay less attention to the happy and peaceful moments. In a 2016 study, a small group of Israeli women in their second and third trimesters received a half-hour training in this type of mindfulness. Then, for two weeks, they wrote diary entries twice daily about how they felt physically and mentally, a way of helping them realize how much things change. Compared with groups of women who simply read about other women's positive and negative experiences during pregnancy, or did nothing specific at all, women in the mindfulness group saw greater increases in their reports of well-being and positive feelings like enthusiasm and determination across the duration of the exercise. Also, the more mindful they were after the experiment (as measured by questionnaire), the higher their well-being, life satisfaction, self-esteem, and positive feelings one month after the birth--a time when women need all the resources they can get. Nurse-midwife Nancy Bardacke developed the Mindfulness-Based Childbirth and Parenting (MBCP) program after training in and teaching Mindfulness-Based Stress Reduction (MBSR), a widely researched program developed by Jon Kabat-Zinn. MBCP takes principles from MBSR and applies them to pregnancy, teaching mindfulness practices alongside insights about labor and breastfeeding. It includes three hours of class per week for nine weeks, as well as a daylong silent retreat. In a small 2010 pilot study, 27 women in their third trimester of pregnancy participated in the MBCP program with their partners. In addition to improvements in pregnancy anxiety and stress, participants also reported experiencing stronger and more frequent positive feelings--such as enjoyment, gratitude, and hope--after the program. "I definitely am aware of trying to be in the moment and that each moment, good or bad, will pass," said one participant. "When I got really worried about the birth, I would just breathe to stop my mind from going all sorts of bad places." Among pregnant women's worries, the possibility of a premature birth looms large. "Preemies" (babies born before 37 weeks) are at risk of breathing problems, vision and hearing issues, and developmental delays. And mothers of preemies have high rates of anxiety, depression, and stress, which often go unacknowledged in the face of the baby's needs. Here, too, mindfulness may have a role to play. In a 2005 study of 335 pregnant women in Bangalore, India, half were assigned to practice yoga and meditation while the other half walked for an hour per day, starting in their second trimester and continuing until delivery. The yoga group, who took yoga classes for a week and then practiced at home, had fewer premature births and fewer babies with low birthweight. Another indicator of newborn health is the Apgar score, usually measured minutes after birth, which takes into account the newborn's complexion, pulse, reflexes, activity level, and respiration. In the 2016 Israeli study mentioned above, women's reported levels of mindfulness after the experiment were linked to their babies' Apgar scores, even after controlling for socioeconomic status. One 2011 study found that a mindfulness program reduced premature births, but not birthweight or Apgar scores. Here, a group of 199 second-trimester pregnant women in Northern Thailand either got typical prenatal care or participated in a mindfulness program. Two hours a week for five weeks, the mindfulness group learned different meditations and how to cultivate awareness and acceptance of their thoughts and emotions. During and afterward, they were encouraged to meditate for over an hour daily across several different sessions. In the end, only six percent of women in the meditation group delivered their babies prematurely, compared with 16 percent in the care-as-usual group. Could mindfulness help reduce premature births in women who are most at risk for them, including low-income and older women? That's a question for future research to address. A new wave of research is looking at the impact of motherly mindfulness on infancy, following babies as they develop. In a 2015 study from the Netherlands, babies whose mothers measured high in mindfulness at the beginning of the second trimester had fewer developmental problems. At 10 months, according to mindful mothers' reports, babies were less likely to have difficulties settling down and adjusting to new environments ("self-regulation") or controlling their attention and behavior ("effortful control"). For example, the babies might be more likely to calm down faster after crying or keep their hands off things they're not supposed to touch. For boy babies, the difference in self-regulation was linked to their mindful mothers being less anxious. Another 2015 study looked at a different indicator of healthy development: babies' attention to sound, which is critical to learning language. Here, researchers recruited 78 pregnant women in their second trimester and asked them about their levels of mindfulness. When their babies were 10 months old, the mothers brought them into the lab to listen to some audio recordings: a mix of repetitious sounds interspersed with novel ones. Based on brain activity, they found that the babies of more-mindful mamas payed less attention to the repetitious, irrelevant sounds--indicating an efficient use of attentional resources. Of course, there are many measures of healthy development, and these studies only represent a select few. But the fact that any links were found at all suggests the interesting possibility that the benefits of mindfulness don't end with the mother, or with the birth, but extend into childhood and perhaps even beyond. For now, however, researchers are still talking in terms of possibilities and preliminary evidence. In fact, a May 2016 review of 17 studies didn't find evidence that mindfulness programs improved pregnant women's depression, anxiety, and stress compared with control groups (although the before-and-after snapshots looked good). Why? Overall, the women's levels of mindfulness didn't increase; the programs weren't actually working. This may be because women weren't practicing meditation at home as much as recommended, or because the mindfulness programs in the experiments weren't as comprehensive and substantive as they could have been. In addition, the benefits don't always last. 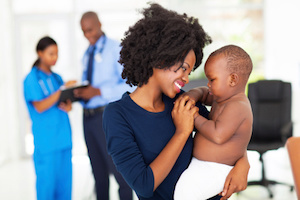 In the Mindful Motherhood study mentioned above, differences in anxiety and negative emotions between mothers in the program and the control group weren't significant at a three-month follow-up. The same was true for mothers in the 2014 study who took classes at the Mindful Awareness Research Center; after six weeks, they weren't faring better on anxiety than the group who read a pregnancy book. The upshot is that mindfulness is a practice, and you have to practice it--again and again and the day after that, too. In that way, it's a bit like parenting: something you work on day by day, even on the bad days when it seems like nothing is going right. There's a lot of tedium to both--changing diapers, counting breaths--but all it takes is a single moment of pure love and peace to remind you why you wanted to do this in the first place.